Mali is a landlocked country, formerly part of the three ancient Sahelian empires of Ghana, Mali and Songhai. A the height of the Mali empire in the 13th century, the town of Timbuktu was a centre of culture, learning and Islamic religion, and Djenne was an international trade centre. In the late 19th century, France seized control of the present day area of Mali, making it a part of French Sudan. Mali won independence in 1960 as the Mali Federation with Senegal, shortly afterwards becoming the Republic of Mali in its current borders. Under one-party rule until a coup in 1991, Mali transitioned to a multi-party state with the first elections in 1992. Mali was perceived internationally as a fairly stable democratic country during this time. In 2012 there were two military coups and armed conflict between the state, Tuareg Islamic militants, which was eventually resolved with a return to democratic elections in 2013. The economy has traditionally relied on agriculture. Desert areas are only suited for pastoralism, but there is cultivation of many crops including rice, groundnut and cotton (the latter particularly important as an export crop) in the less arid south and around the Niger River. There are also areas of irrigated vegetable production, but these are less economically significant on a national scale. Post-independence, drought was one factor leading to economic decline. Remittances from migrants to Cote d’Ivoire have also been important, and the return of many of these people during periods of instability in Cote d’Ivoire in 2002 and 2010 had an impact on the livelihoods on many Malians. There are attempts to diversify the economy with development of the mining industry, including gold, phosphate and kaolin. With a largely semi-arid to arid climate, Mali has limited surface water resources in the north, but two major river systems in the south of the country are a key resource. Mali also has huge stores of groundwater in major aquifer systems, with a mix of fossil and actively recharged groundwater. Please cite this page as: Traore, Bokar, Sidibe, Upton, Ó Dochartaigh and Bellwood-Howard, 2018. Mali. Map developed from USGS GTOPOPO30; GADM global administrative areas; and UN Revision of World Urbanization Prospects. For more information on the map development and datasets see the geography resource page. The northern part of Mali is dominated by the Sahara desert, which transitions into the semi-arid Sahel region to the south. The southern part of Mali is characterised by savannah, encompassing the large inland delta of the Niger River. The highest point is Hombori Tondo (1153 m), located in central Mali; there are also upland areas in the north east along the border with Algeria. The climate of Mali transitions from tropical savannah in the south, to hot arid steppe and hot arid desert in the north. Average annual rainfall is >1000 mm in the south, decreasing to <200 mm in the north. Average annual temperatures increase from the savannah north into the Sahel region, but decrease slightly in the northeast, where land elevation is higher. Mali's climate can be split into three distinct seasons, the length and severity of which vary with latitude. October to January is generally characterised by cooler and drier conditions; February to May is also relatively dry but the temperatures start to increase; and June to September is relatively wet and temperatures fall slightly. More information on average rainfall and temperature for each climate zone can be found on the Mali Climate Page. Low rainfall means there is little to no perennial surface water in the northern part of Mali. The south of the country is dominated by the Niger River, which creates a large fertile inland delta as it flows from Guinea in a northeasterly direction through Mali, before turning south into Niger and ultimately discharging into the Gulf of Guinea. A stretch of the Senegal River flows through the western part of Mali, after originating in Guinea. It flows in a northerly direction through Mali and along the Senegal/Mauritania border, before discharging into the Atlantic Ocean. Major surface water features of Mali. Map developed from World Wildlife Fund HydroSHEDS; Digital Chart of the World drainage; and FAO Inland Water Bodies. For more information on the map development and datasets see the surface water resource page. Soil Map of Mali, from the European Commission Joint Research Centre: European Soil Portal. For more information on the map see the soil resource page. The northern part of Mali, which is dominated by the Sahara desert, is characterised by sand dunes (Arenosols) and weakly developed stony Cambisols and Leptosols. The area of Cambisols in the northwest corresponds with the Tanezrouft Plateau. Iron rich Plinthosols extend from the south into the Sahelian region, and are typically associated with a fluctuating water table. Gleysols, which form under prolonged periods of saturation, are found along the course of the Niger River. These are important agricultural zones. Land Cover Map of Mali, from the European Space Agency GlobCover 2.3, 2009. For more information on the map see the land cover resource page. This section provides a summary of the geology of Mali. More detail can be found in the references listed at the bottom of this page. Many of these references can be accessed through the Africa Groundwater Literature Archive. The geology map on this page shows a simplified version of the bedrock geology at a national scale (see the Geology resource page for more details. Geology of Mali at 1:5 million scale. Based on map described by Persits et al. 2002 / Furon and Lombard 1964. For more information on the map development and datasets see the geology resource page. Unconsolidated sedimentary deposits Quaternary Unconsolidated sediments are not shown on this geology map, but are found in places across the country at different thicknesses. The main Quaternary sediments in Mali are alluvium (deposited by rivers) and sand dunes. Alluvial deposits are found along the course of the Niger River, particularly in the inland Niger River delta region. Sand dunes are well developed in the Sahara desert. There are also small outcrops of lacustrine deposits in some hollow inter-dune areas. Alluvium can reach thicknesses of 10-20 m in the Niger River delta. Continental Terminal Miocene-Pliocene The Continental Terminal sequence comprises sandstones and unconsolidated sands. It overlies the Gouma Precambrian metasediments; Continental Intercalaire formations of the Iullemeden Basin, and marine sediments of the Sudanese Strait. Variable thickness from a few tens of metres (Nara ditch) to over 1000 m (Sudanese Strait). Marine Sediments Upper Cretaceous – Lower Eocene (Tertiary) This unit comprises marine sediments, which were deposited primarily along the western margin of the Adrar des Iforas (Sudanese Strait). Limestone, containing varying amounts of marl, predominates at the base of the sequence. Sandstone and clay are dominant towards the top of the sequence. Continental Intercalaire Lower Cretaceous These rocks consist of sandstone, conglomerate and arkose, with varying amounts of clay. It is a continental infill sequence, which was deposited in the Azaouad Basin (north) and the Iullemeden Basin (east) prior to the mid-Cretaceous marine transgression. Thicknesses of 500 to 1000 m.
Dolerites Permian - Triassic Volcanic rocks consisting of basalts and gabbros. The volcanic rocks commonly occur as dykes or laccoliths, depending on the lithology of the host rock. The thickness of laccoliths can exceed 100-150 m, for example in the Kaarta Nossombougou plateau area. Cambrian - Carboniferous Sandstone, limestone and shale. These rocks can reach thicknesses of over 1000 m.
Plateaux Greseux and Gourma Infracambrian (Proterozoic) Predominantly low-medium grade metamorphosed sandstones, with varying amounts of mudstone and limestone. These sediments were deposited unconformably over the cratonic basement in a subsiding basin, and were subsequently deformed during the Pan-African orogeny. The schist-facies rocks become more calcareous towards the Gourma region in the east. Outcrops extensively in southern Mali, with variable thickness (10-800 m) depending on the depositional environment. The maximum thickness in the south is around 600 m. This increases eastwards towards the Gourma region. South Birrimien (Bougouni Region), West Birrimien (Kenieba), West Birrimien (Boutonniere de Kayes) and Adrar des Iforas Precambrian The West African Craton outcrops in four main regions. It consists primarily of gneiss, mica schist and quartzite, which represent metamorphosed volcanic-sedimentary sequences. The original sedimentary sequences, which include shale, arkose, greywacke and conglomerate, were interbedded with volcanic rocks, including basalt, gabbro, dolerite, rhyolite and tuff. Granitic intrusions (pegmatite facies) are common in the southern regions and are often porphyritic. The Birrimien generally has a NE-SW to NW-SE trending fabric. Basement rocks in the Adrar des Iforas region underwent further deformation during the Pan-African orogeny and are therefore structurally more complex. 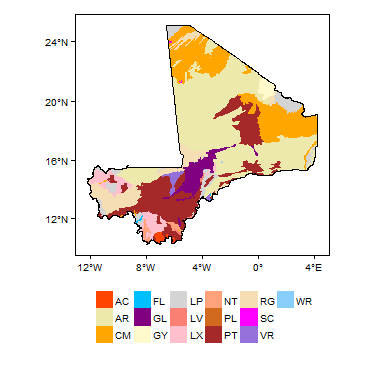 This section provides a summary of the hydrogeology of the main aquifers in Mali. More information is available in the references listed at the bottom of this page. Many of these references can be accessed through the Africa Groundwater Literature Archive. The main aquifers of Mali can be distinguished by their dominant flow type – those in which flow is mainly through fractures, and those with significant intergranular flow. Fractured aquifers are more common in southern Mali, occurring in the Precambrian cratonic and metasedimentary basement rocks. The aquifer properties are largely determined by the nature, extent and interconnectedness of fractures. Drilling success rates in the fractured basement aquifers vary widely from 40 to 80%. Intergranular aquifers are generally associated with poorly consolidated or unconsolidated sediments in the large sedimentary basins of eastern and northern Mali. These deep aquifer systems are often overlain by shallow superficial Quaternary aquifers, which in some cases are in hydraulic continuity with the deposits below, or may act as perched systems. Intrusive igneous rocks (dolerites) can either act as a barrier to flow, or can provide preferential pathways for groundwater flow. Under certain conditions they also form aquifers of local importance. In the Khenachich Region the deposits primarily comprise coarse sandstones and conglomerates interbedded with thick clays. Aquifers are shallow and isolated. Along the southeastern flank of Adrar des Iforas, coarse sandstones are interbedded with shales, forming continuous, multi-layered aquifers. The Tegama sandstone forms the most significant aquifer in this region. In the Azaouad region the deposits comprise locally coarse sands interbedded with sandy clays forming a multi-layered aquifer. In the Nara ditch region an upper aquifer, comprising mainly sands, is separated from a lower conglomeratic sandstone aquifer by a clay layer. The upper aquifer is unconfined and exploited by many traditional wells. Borehole yields and transmissivity vary across the four regions described above. Average yields are between 9 and 12 m³/hour. The maximum yields (50 m³/hour) are found in the Nara ditch region. Transmissivity varies between 10 and 3500 m²/day, with an average of around 600 m²/day. The average thickness of the continental aquifers is 150-200 m. The thickness increases to 500 m in the Nara ditch and towards the border with Mauritania. Where unconfined, the depth of the water table is typically around 40 m below ground level, although this decreases southwards where the topography is lower. Borehole depths vary significantly between 45 and 450 m. The maximum known borehole depth is 1000 m.
The continental aquifers contain a combination of fossil and renewable (actively recharged) groundwater resources. Groundwaters are mineralised to moderately mineralised with conductivities between 400 and 6000 S/cm. Recharge is generally low. The Upper Cretaceous/Eocene aquifer occurs around the western fringes of the Adrar des Iforas region. The aquifer comprises marine sediments: shale and argillaceous sandstone interbedded with limestone; local phosphatic layers; and lignite layers. To the west and south the marine deposits sit unconformably over the Precambrian basement, while to the north and southeast they overlie Continental Intercalaire deposits. The Upper Cretaceous/Eocene marine sediments are generally considered a poorly productive aquifer. Groundwater in water-bearing sediments is generally confined. The extent of higher permeability sandstone layers is not well defined, because of a lack of borehole data. Average borehole yields are around 7 m³/hour. Transmissivity values have been reported between <1 and 800 m²/day, with an average of 170 m2/day. Water-bearing sediments range in thickness from less than 100 m to over 400 m. Boreholes are typically drilled to between 110 and 165 m depth, with a maximum of >500 m.
Generally considered a poorly productive aquifer. Water quality is generally poor, with high salinities reported, particularly in western regions where groundwater is considered brackish. The Continental Terminal formation and the overlying Quaternary deposits are in hydraulic continuity, and are generally considered a single, multi-layered aquifer. The aquifer consists of vast alluvial plains with permanent surface water and extensive flood zones. Borehole yields generally range from 8 to 23 m³/hour, but can exceed 100 m³/hour in the most productive layers. Transmissivity is generally reported between 25 and 500 m²/day, but can reach >4000 m²/day under certain conditions. Storage is typically on the order 10-4. The unconsolidated aquifers are unconfined and can range in thickness from less than 100 m in the western part of the inland delta to 1000 m in the axial zone of the Gao ditch. The depth of the water table can vary between 0 and >80 m below ground level. Boreholes are typically drilled to depths of 50-150 m.
There are no major groundwater quantity issues. The aquifer is highly productive and receives abundant recharge. There are no major groundwater quality issues. Water in the Gao ditch region is moderately mineralised; mineralisation is low elsewhere. The aquifer is predominantly recharged by surface water. The Infracambrian metasediments contain varying amounts of low permeability shale, located in the Sahelian region where recharge from rainfall is relatively low. The Infracambrian aquifers are therefore discontinuous and associated with fractures in the more competent sandstone and limestone layers. They are typically semi-confined. Average borehole yields are between 6.5 and 8 m³/hr; yields of more than 10 m³/hr may be achieved in karstified limestone or fractured sandstone layers, particularly where recharge is increased by inputs from surface water. Transmissivity is generally less than 20 m²/day, although it may vary between <1 and 80 m²/day. The Infracambrian aquifers can be up to 120 m thick. Average water table depths are around 40 m below ground level, but maximum water table depths of 96 m have been reported, and minimum depths of 20 m are often found where the aquifer is recharged by surface water. Boreholes are typically drilled to 70-100 m depth, but can reach 200 m depth in some areas. Drilling success rates in the Infracambrian aquifers are generally less than 50%. Borehole yields are generally low, but the Infracambrian aquifers are considered a renewable resource due to active recharge from the Niger River. Groundwaters are generally mineralised, with slightly basic pH. Aquifers are recharged by surface water from the inland Niger River delta. The hydrogeological characteristics of this aquifer are determined by the presence of low permeability shale in the sedimentary sequence, and the frequency and character of the often massive dolerite intrusions. Groundwater flow occurs predominantly in fractures within the sandstone and limestone layers. Average borehole yields are around 6 m³/hr, with a maximum reported value of 90 m³/hr. Transmissivity varies between <0.01 and 450 m²/day, with an average of around 20 m²/day. Storage is generally around 10-5. The Cambrian aquifers are typically semi-confined. The fractured horizons are around 40-45 m thick with major inflows generally occurring between 20 and 40 m depth. Rest water levels are typically deeper in the north and east. Boreholes are typically drilled to 50-80 m depth, with a maximum depth of 242 m recorded. Drilling success rates in the Cambrian aquifers are generally less than 50%. Groundwater in the Cambrian aquifers is considered to be a renewable resource due to active recharge from overlying alluvial deposits. Groundwaters are generally highly mineralised and may have elevated salinity. Preferential recharge occurs through fractures from overlying alluvial deposits. Little is known about the hydrogeology of the Cambrian aquifer in northern Mali. Groundwater is associated with karst features in limestone layers in the central part of the Taoudeni Basin. Exploitation is limited due to poor water quality. Groundwaters are generally highly mineralised and have elevated salinity. In the south and southwest of Mali the Infracambrian metasediments form a multi-layered, and generally semi-confined, aquifer. Higher permeability layers are generally associated with fracturing and are often connected by a network of sub-vertical fractures. Dolerite intrusions may increase the density of fracturing in some areas. The metasediments are considered a dual permeability aquifer: low permeability layers provide greater storage, while more fractured layers have higher permeability and lower storage. Average borehole yields are around 5-10 m³/hr; however, several boreholes have reported yields of more than 100 m³/hr. Transmissivity varies between <0.1 and 1750 m²/day, with an average of around 20 m²/day. Storage varies between 10-7 and 10-1. The Infracambrian aquifers are highly productive and are considered to contain a renewable resource. They are used for public water supply in several cities, including Sikasso and Koutiala. Groundwaters have low mineralisation (300 S/cm) and slightly acidic pH. The metasedimentary aquifers in this region receive most recharge during the rainy season. Recharge is estimated to be 7-20% of annual rainfall. Basement Aquifers - Moderate to Very Low Productivity The basement aquifers of Mali can be divided into three regions with different hydrogeological properties. All are generally semi-confined. The basement aquifers in the south and southwest are characterised by a thick weathered zone and high rainfall; these aquifers are generally drained by the Niger River system. In the west (Kayes region) the weathered zone is less well developed, and rainfall is lower. The eastern outcrop (Adrar des Iforas) is located in the Sahelian region where rainfall is low. Groundwater occurs mainly in fractures in the basement rock. Small perched aquifers are sometimes found in overlying alluvium. Average borehole yields range from 4 to 6 m³/hour, depending on the lithology. The average transmissivity of the basement rocks is 7 m²/day, with a maximum of 350 m²/day and a minimum of <0.1 m²/day. Storage is generally around 10-4. The thickness of the productive zone varies from 12 to 51 m. Rest water levels are generally between 8 and 20 m below ground level, but can be as deep as 70 m. Boreholes are typically drilled to depths of 40-80 m, but can exceed 200 m in some areas. Drilling success rates in the basement aquifers is typically between 60 and 80%. Basement groundwaters in the south and southwest have low conductivity (average 375 uS/cm) and an average pH of 7.2 (although this can vary between 5.6 and 8.8). Chloride and sulphate concentrations are less than 20 mg/l. In the Kayes and Adrar des Iforas regions, groundwaters are more mineralised, with conductivities around 1000 S/cm and 300-8000 S/cm, respectively. The basement aquifers receive the majority of recharge during the rainy season. Recharge is estimated to be 7-20% of annual rainfall. Groundwater resources in Mali are generally under-exploited and there are no significant widespread issues with groundwater availability. The west and south, which is dominated by fractured or weathered zone aquifers, is characterised by slightly acidic groundwater with low levels of mineralisation (<500 micro microSiemen/cm). The western border of Mali and Mauritania is characterised by high nitrate. The north and east of Mali, where aquifers receive significantly less recharge and groundwater is more highly mineralised than in the rest of the country, with electrical conductivities usually exceeding 1000 microS/cm, locally exceeding 5000 microSiemen/cm, and reaching 50,000 microSiemen/cm in some parts of the Sahara. Groundwater is generally not significantly affected by human activities. However, localised issues of urban and agricultural pollution have been reported, particularly in shallow alluvial and weathered zone aquifers. Deeper aquifers can be vulnerable to contamination if there is a hydraulic connection between the shallow and deep systems. The total groundwater resource in Mali is estimated at 2.7 trillion m³. The level of groundwater exploitation, primarily for drinking water supply, is considered to be low: it is estimated to be 66 billion m³. Groundwater is largely exploited by boreholes and large diameter wells, of which there are an estimated 15,100 boreholes and 9,400 large diameter wells (information from National Water Directorate (DNH) for 2003). Groundwater is an important resource for many sectors in Mali, including domestic and agricultural supply, energy, transport and industry. Each sector therefore plays a role in the management of the resource. The Ministry of Energy and Water is the main institution responsible for water resources management, including groundwater and surface water. It has a statutory role to protect and manage all aspects of the water environment, which is achieved through the National Water Directorate (DNH). Law No. 02-006 (2002) of the Water Code provides legislation regarding the use and protection of water resources, including the rights and obligations of all users. Local municipal councils are responsible for the design, implementation and operation of water supply systems in their regions. This is achieved through Municipal Development Plans. The Ministry of Environment and Sanitation, through the Department of Sanitation, Pollution, and Nuisance Control, is responsible for all legislation related to sanitation standards and pollution. There are two main national databases of groundwater supply points: one for boreholes (approximately 19,000 in 2008) and one for hand dug wells (approximately 10,000 in 2008). No geological log information for the boreholes is available, but there is good information on rest (static) groundwater levels in boreholes and hand dug wells. Information on major inorganic groundwater quality parameters, measured at the time of drilling, is also recorded. A network of 230 groundwater level observation boreholes was established in central and southern Mali by the UNDP between 1981 and 1991. However, since 1994 there has been no follow-up drilling, and monitoring equipment has not been replaced. In a 2005 inventory the network was found to be largely outdated and out of use. There is no national groundwater quality monitoring programme. The Iullemeden Aquifer System (IAS) is shared by Mali, Niger and Nigeria over an area of 500,000 km². 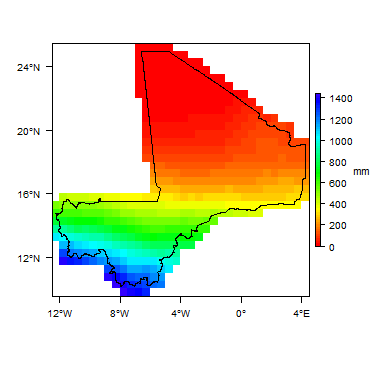 The project "Managing hydrogeological risks in the SAI Iullemeden Aquifer System", which was implemented by the Observatory of the Sahara and the Sahel (OSS), has improved the general understanding of this aquifer system through the development of several tools, including a groundwater database, mathematical model, and thematic maps. It has also developed a Memorandum of Understanding between the three countries regarding water resources management of the IAS. The Taoudeni/Tanezrouft Sedimentary Basin, which is shared between Mali, Mauritania, Algeria, and Burkina Faso, is also the subject of a transboundary study : "Concerted and Integrated Management of Water Resources in the Iullemeden Aquifer System, Taoudéni / Tanezrouft and the Niger River " (GICRESAIT).